Want a flat trailer fender for your homebuilt chopper death machine? 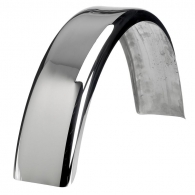 Want it made out of stainless steel and polished to a mirror finish? Well we have you covered! These thick & sturdy steel flat fenders are 6" wide, and constructed from 14ga stainless steel. They fit a vintage-style, high-sidewall 16" tire quite well, and also work with 18" and even 19" rims, though the full fender length may not follow the tire radius spot on so cutting the fender shorter may look better. The real nice thing is they are polished stainless steel, so run as is, cut shorter, weld stainless trim or brackets to it and you are good to go. 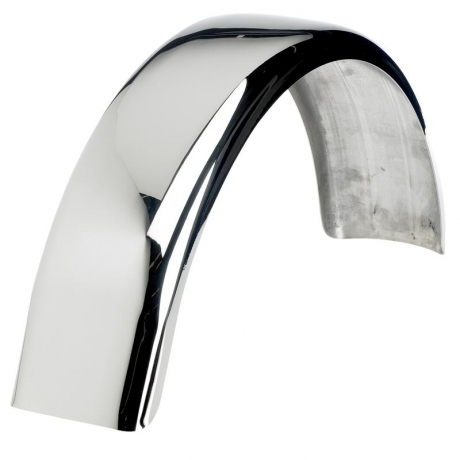 No peeling chrome, no chipped paint, and you get the rich, deep shine of polished stainless to class up your chopper. 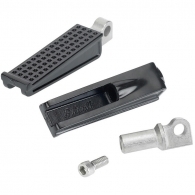 Sanderson Cast Black Stainless Foot Pegs 3710грн. 8710руб. 130.00usd.